dBad Language: Yes! "Turd" used countless times throughout the movie. 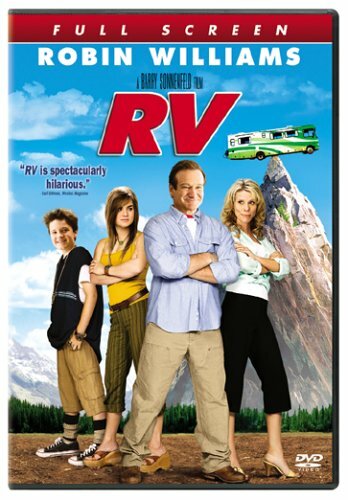 RV had potential – Robin Williams and Jeff Daniels alone gave it potential – but the use of the word “turd” – continuously – throughout the movie, rendered it completely inappropriate and unwatchable. Which it isn’t. Not coming out of the mouth of a child (as it does frequently in the movie). If you want a very similar “hapless dad takes family across country in an RV” movie, without the turds, try Beethoven’s 3rd instead (although be warned that there is an incident with a tranquilizer dart, some bumbling thieves, and an accidental kidnapping in that movie). Are you kidding me? You find the word “TURD” offensive. We lost so many good people over in Afghanistan and we have you here! What a waist of skin. I have to agree with the above poster at least about the turd comment, it was very subtle most of the times it was used, the only times it was used in a way that was really understandable (IE: not kind of underwhelmed by music or action going on, or: You have to listen for it) was at the beginning of the movie when they decided to call it the giant rolling turd or something like that, and yea the word was used maybe ten times in this scene, and then throughout the movie they’d run onto the RV and say onto the turdmobile or something like that, but again had to be listening for it. I think there was another scene near the end where you could understand what they were saying, but could be wrong. I think that this is an amazing movie and it makes up for the word “Turd”. I would Highly recomend this movie to families because it teaches the importence of family. I loved this movie and i don’t think that the use of one word that is found offencive, can ruin a perfectly amazing movie. Robin Williams is at his best bere and the others are too. This movie teaches lots of lessons so watch this movie and you won’t be sorry!